The body tracking of the Microsoft Kinect One or 2 has been improved compared to the Xbox 360/Kinect. Although the functionality is largely the same, you will get better results with the new Kinect. Kinect can be combined with Oculus Rift to get full body tracking. Important Note: the combination of Kinect with HTC Vive is supported but will lead to major tracking issues for the HTC Vive because the IR beam from the Kinect will interfere with the IR signals coming from the lighthouses. It is recommended to position the Kinect at an angle of 90 relative to the lighthouses. Microsoft Kinect 2 is supported in InstantVR Advanced and Edge version 3.0 and higher. Microsoft Kinect 2 is supported in the Humanoid Control VR and Pro packages. Microsoft Kinect for Windows 2 and Microsoft Kinect One using the applicable adapter are supported. Microsoft Kinect 2 requires Microsoft Windows 10 or higher. The Kinect for Windows SDK v2 is required for the Microsoft Kinect 2 support. It can be downloaded from the Microsoft Download Center. Microsoft Kinect support needs to be enabled in Edit Menu->Preferences->InstantVR->Kinect Support. The script IVR_Kinect2 should be added to the character’s GameObject. Make sure this script is listed higher than any IVR_Traditional or IVR_Animator script. Microsoft Kinect support needs to be enabled in Edit Menu->Preferences->Humanoid->Kinect 2 Support. Disabling Kinect 2 Support ensures that no code related to Kinect 2 is included in the build. To enable tracking for an avatar with Kinect, Microsoft Kinect 2 needs to be enabled in the Humanoid Control component. The Microsoft Kinect 2 (Transform) is a reference to the Transform in the scene representing the Kinect Sensor. 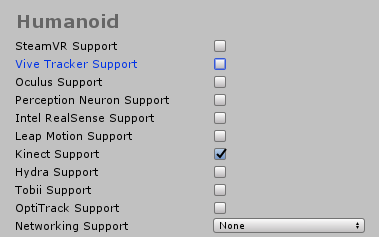 This GameObject is found as a child of the Real World GameObject and is only visible in the scene when Humanoid Control->Settings->Show Real Objects has been enabled. The Microsoft Kinect 2 (Transform) can be used to change the position of the tracking relative to the player in the scene. When the Kinect 2 is used in combination with the Oculus Rift in a higher position, the position of the Microsoft Kinect 2 (Transform) is automatically determined. Head tracking, face tracking and audio input can be enabled separately on the head target. Face Tracking is only available in Humanoid Control Pro, which supports Face Tracking. Positional and limited rotation tracking is supported. Due to the limitation of the Kinect, only the X and Y rotation axis are supported. Hand movement input is limited to closing, opening the hand and the ‘ lasso’ position: index and middle finger pointing, all other fingers closed. Only positional tracking is supported. Only positional tracking is possible.